All About the ALSOPS: Beach Beach and more BEACH! Beach Beach and more BEACH! We love the beach, our visitors love the beach and the beach is only 30min away....so that means, WE GO TO THE BEACH and enjoy it every time! Between moving here at the end of July and the middle of September we probably visited the Beach almost every weekend. We have packing our gear up down to a Science and have learned what time we have to make it to the parking lot by for free parking. Some of our first purchases when we got here were beach chairs, beach umbrella and boogie boards. This all came before the lawn mower or any house necessities. A definite highlight is probably the dolphin sitings almost every time we go. It is just amazing to watch as they swim by in groups and often appear to be putting on their own little show. Our good friends the Borgs came down to visit only a few weeks after arriving here but those few weeks felt like an eternity in our children's eyes and we even had to make a count down chain in anticipation. 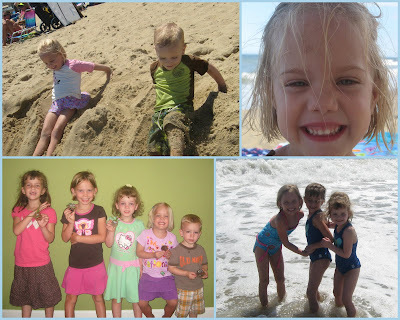 The kids were in heaven and had an absolute blast together at the beach. All day wasn't enough as we continually said, "5 more minutes and then we have to pack up" I was able to sit back and just watch most of the day. :) Kylee is always more adventurous in the ocean when she has others to do it with and now after several trips she has it down. 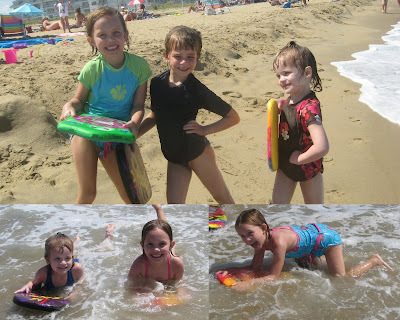 This trip was the beginning of boogie boarding as the 3 older girls lived on these tiny surf boards. The size never bothered them but I knew Ky was ready for a real boogie board and so were her thighs after the sand burn they had received from this day of non-stop fun. After a few more visits she has graduated to this and can't wait to do it with her friends. Alexis gives it a quick attempt at times but can't stand any salt water getting in her eyes. Her favorite thing is to be held in the ocean as we jump over the waves for her. She often puts her head down on our shoulders and just rests. Occasionally she gets hit by what she calls a "Slapper" (a wave that breaks and manages to splash her) and loves it when we get plenty of "Rollers." She is our snack aholic and is often found under the umbrella munching away or playing in the sand singing to herself. Building sand castles and catching any sea creature possible is always an adventure. Lexi has followed in her sisters footsteps and has no fear of them. She enjoys taking care of the crabs and collecting jellies. 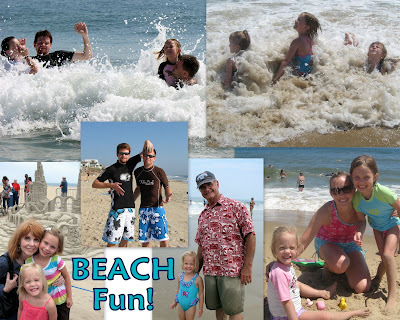 The fabulous Budge family came down from Charlottesville for a quick trip which we packed full with the beach. Alexis and her best friend Chloe picked up right where they had left off. Chloe was Lexi's first real friend and we miss her dearly. These 2 are so cute together. I was longing for a friend to chat with and Erin is always there for me so we pretty much talked each others ears off for 24 hrs. Kylee loves that when people come to visit it means she gets to have a sleepover and was just thrilled to have Nia spend the night in her room...don't get me wrong the beach was a blast too as it always is. What can I say...FRIENDS are the BEST and right now we are missing them all dearly. Ryan and his girlfriend Leisa visited for a week and the girls had a blast being their shadow. We had a great time at the beach, Bush Gardens and up at the boardwalk. Kylee had been begging for weeks to try out the group bikes up at the boardwalk and we told her we would when uncle ry ry came to visit....and we did. Skylar was our crazy driver and Ryan was our conservative back seat driver with Leisa and I apparently along for the ride according to the guys as the chain came off on our side for maybe a minute but to them it equaled the entire trip. The girls enjoyed laughing and Lex was a trooper as we drugged her up to go and took her with a fever and still made it for the fireworks on the beach. We stopped on our bike ride for some great shots on the turtles. We enjoyed a fun Labor Day weekend with my parents and sadly didn't take one picture but as always had a blast at the beach and enjoyed going to the Aquarium for our first time. Skylar's Mom came out for her first visit the beginning of October and was here to enjoy the Neptune's Festival with us which included an amazing sand sculpting contest up at the beach. This was just incredible and none of us had seen anything like it. Getting soaking wet in the rain didn't stop us. All in all the BEACH has always been a big part of our lives and now just became even BIGGER! and as you can see...VISITORS ARE ALWAYS WELCOME! Oh my heck! I want to come visit so bad!!! That beach looks awesome! Maybe next summer? Just kidding...we'll have four kids and are going to be broke for forever. But someday! Cheryl, it looks so fun there, I am so happy for you guys. And we rode one of those exact same bikes in Oceanside last month, I just never posted a picture. So fun! Hey! This is Ryan and Leisa! This is soooo awesome! We love it! You should send us all the pictures you have from our visit. :) Thanks for the great time! We both had a blast and can't wait to come back. Wow, yet another amazingly fun place to live and visit. 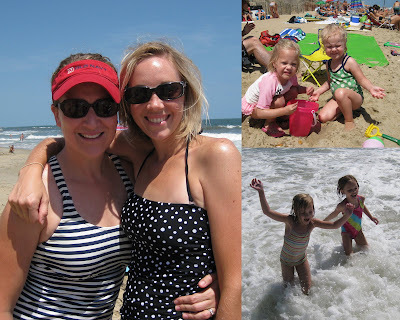 I am glad you have had so many visitors to help your transition along to Virginia Beach. We will be excited for our turn for you to show us a good time in December. 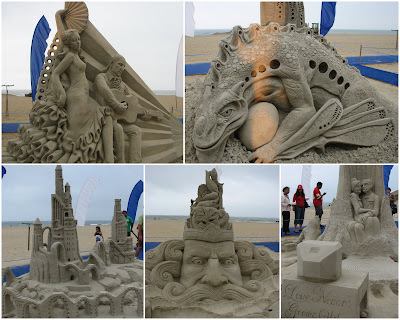 Great pictures and those sand sculptures are incredible! Way to go Ky on your boogie boarding! That looks awesome. Peyton enjoyed your video too. Holy cow, those sand sculptures are amazing! Too bad we couldn't come in October. It was so fun to visit you and we miss you so much! It's just not the same, so please come visit soon! Ok... I am now green with envy! I miss the beach! With my workaholic husband we haven't taken as many trips as we have in the past. 1 trip to Florida is just not enough to satisfy the beach craving.